In late March 1975, a CIA operative named Frank Snepp made a report to his superior in Saigon, U.S. Ambassador Graham Martin. Martin had been appointed to his post because of his reputation as a hard-liner who would never admit defeat. Snepp told Martin that he had just witnessed, from a plane window, thousands of South Vietnamese soldiers in abject retreat from the advancing North Vietnamese Army, shedding their guns and uniforms and racing into the sea. The implication was clear to Snepp. It was way too late for heroes or happy endings. Saigon was fucked. “I don’t believe you,” Graham Martin said. A couple weeks before the fall of Saigon, Sports Illustrated featured a picture of a handsome clean-cut man on the cover. The year before, as the American President was being forced from office for criminally subverting democracy, the handsome clean-cut man had become the first baseball player voted onto the all-star team as a write-in candidate. Democracy is dead. Long live democracy! “Steve Garvey: Proud to be a hero,” the cover caption read. The magazine was surely still on coffee tables and in waiting rooms when the most desperate images of the fall of Saigon reached home. These images—people crowding rooftops, awaiting rescue that would never come—found an awful echo on American soil, across the East River from me, some twenty-six years later. Look away. Keep dreaming. Look away. When I was a kid I used these baseball cards to dream myself into the True America, the one I believed existed somewhere far away. A True American was happy and painless. A True American was clean-cut and handsome. A True American looked you right in the eye, no sarcasm or fear or complicated feelings. No weird hippie food or long hair or unusual family configurations or night terrors or secrets. A True American stood proud and tall. He didn’t skulk through his own town like an outsider when he needed to go buy more baseball cards. A True American played every game and collected two hundred hits every year and a hundred RBI every year and was elected to the all-star team every year and wore red, white, and blue and was proud and was a hero. Denis Johnson’s 2007 Vietnam War novel Tree of Smoke has no central character, no hero. The titular term comes up at various times in the narrative, first as an apocalyptic biblical reference from the Book of Joel (“there shall be blood and fire and palm trees of smoke”), later as the name for a shadowy rogue operation dreamed up by a CIA operative named Colonel Sands. The Colonel, a charismatic, domineering personality and hero of an earlier heroic American war, is out of sight for most of the novel, his general absence heightening the sense that the world of the novel is one without a center or the hope of some kind of redemptive heroism. He goes on to give a long speech about the 1966 football game between Notre Dame and Michigan State, the so-called “Game of the Century” that ended in a tie when Notre Dame elected to run out the clock instead of trying to go for the win. The point, which eludes the interest of the soldiers, those pioneers of a post-heroic world, is that they shouldn’t leave the enemy battlefield without a victory. “We will win this war,” the Colonel assures no one. Steve Garvey was drafted by the Minnesota Twins in 1966 but elected to go play baseball and football at Michigan State instead. Freshman were not eligible to play on the varsity in those days, but it seems likely that Steve Garvey was very near the mythic action in the Game of the Century. It would seem likely even if he hadn’t been a budding football star at the university that hosted the game. 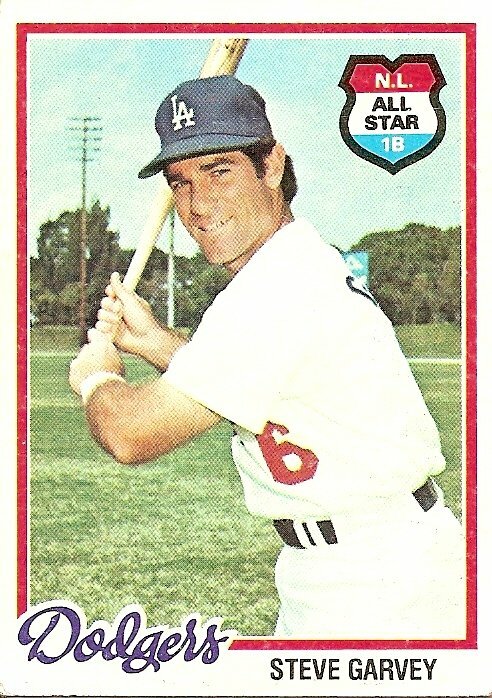 When I was using these baseball cards to dream myself into the True America, Steve Garvey seemed, more than anyone else, as if he had sprung straight out of myth, as if he hadn’t been born and raised somewhere but instead had gradually come into focus, going from an indistinct figure on the misty margins of older myths of glory to a distinct and gleaming hero in the bright summer sun. Five years and one day ago, February 5, 2003, U.S. Secretary of State Colin Powell spoke at the United Nations, attempting to strong-arm support for a U.S. invasion of Iraq. The wall behind him held a tapestry version of Pablo Picasso’s famous depiction of the horror of war, Guernica. The work has no central character, no hero, just the wide howl of a living world torn by bombs. But as Colin Powell used the fictions of Iraq’s weapons of mass destruction and ties to al-Qaida to justify war, none of Guernica was visible behind him. A blue curtain had been hung to hide the tapestry from view. A few weeks later, bombs started falling far away. Here are two versions of history. Both could be said to follow the logic of dreams. 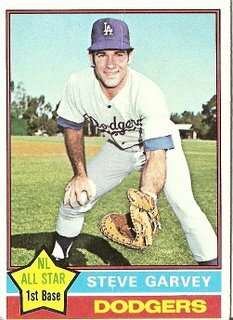 Version one: Steve Garvey did not go to Vietnam because he was a star. He had been a star in college and he was drafted in the first round by the Dodgers and one year later he made his debut in the major leagues, and once you were in the major leagues there was no more Vietnam. The year he made his debut, 1969, he played in spring training alongside a struggling minor leaguer named Roy Gleason. Gleason had played briefly for the Dodgers in 1963, doubling in his only at-bat, then in 1967 after failing to further distinguish himself in the minors he was drafted into the army, the only man to serve in Vietnam after logging so much as a single moment in the major leagues. He was sent home on a stretcher, wounded with shrapnel from a blast that killed the man standing beside him, his friend Tony Silvo. He left behind in Vietnam some personal effects, including his 1963 World Series ring. Version two: Steve Garvey did not go to Vietnam because there was no such thing as Vietnam. Look at the card at the top of this page and tell me there was such a thing as Vietnam. Look at that card at the top of the page and tell me there was a place somewhere full of contradictions and ambiguity and needless suffering. Tell me there was a place where America has been defeated. Tell me there was a place that replaced our innocence with the knowledge that we were capable of unspeakable cruelties, that mutilated or killed our young men, that even stole one of our 1963 World Series rings. If you tell me there was a Vietnam I’ll tell you I don’t believe you. Some years after I first used this card to dream myself into the dream of America, Steve Garvey left the team with the red, white, and blue uniform. The jarring sight of him in nauseous brown and yellow foreshadowed the coming disillusionment that he was at least as complicated and fallible as anyone else. And the devaluing of the myth of Steve Garvey that accompanied revelations that he, as Bill James put it, “couldn’t keep his underpants off the infield” was followed by a gradual devaluing of his accomplishments on the field, former reverence for his ability to collect hits and RBI replaced by notice of his inability to get on base as often or hit for power as effectively as many of his lesser known peers. History has hollowed Steve Garvey. The again, history says that Ford and then Carter led this country after Nixon’s resignation. But if a whole country is dreaming, couldn’t it be said that the figure nearest the center of that dream is the leader? Couldn’t you make a case that in the amnesiac years where Vietnam ceased to exist, those years between the faraway intimations of defeat and the coming of the supreme amnesiac American Dreamer, Ronald Reagan, Steve Garvey minded the store? Couldn’t you make a case that Steve Garvey, the people’s choice, the write-in candidate, the proud hero, was the leader of America Dreaming? The perfect all-American asphyxia-blue two-plus-two-makes-four symmetry of this 1976 card is broken only by the reaching out of the 1974 NL MVP’s glove hand, an aesthetic disturbance that seems to call on the viewer to complete some larger symmetrical pattern. An honorable, well-adjusted, Garveyesque man would respond to this beckoning with a fittingly direct rock-jawed all-American reply. A firm handshake. A straight brisk overhand strike. A logical balancing of the equation. Why does the only answer that appeals to me involve dropping a hefty deuce in the webbing of Steve Garvey’s mitt? You are currently browsing the archives for the Steve Garvey category.